Thanks to Goat Simulator, these little horned animals have found a special place in our hearts. And now Zynga is milking their popularity with a brand new endless hopper game. Mountain Goat Mountain (MGM) lets you help a poor little goat reach his destination and it will take a lot of swipes and taps to help him climb steep slopes and avoid getting smashed by boulders and logs. Gameplay is somewhat similar to Down the Mountain, but the latter has more traps. Sometimes, your goat won’t be able to climb a highly steep slope. In such situations, the only way to avoid getting trapped is to go back or move to adjacent platforms. However, you will notice that going back won’t be possible by simply tapping on a ledge. You will need to swipe downwards to descend from a slope or move back. Swipe right or left if you want the poor billy to hop on to adjacent platforms. Tapping won’t help in most situations, but swiping can really make billy move to the desired ledge. The game’s objective is to reach higher altitudes and springboards can help you do that. If you want to beat your previous best “alt” score, then make the most of these “shortcuts” instead of climbing up on dangerous slopes. Make sure you hop on those springboards that help you go high up the mountain. An arrow marked on springboard shows the direction your goat will reach. Try hopping up on those that have arrows showing an upward direction. 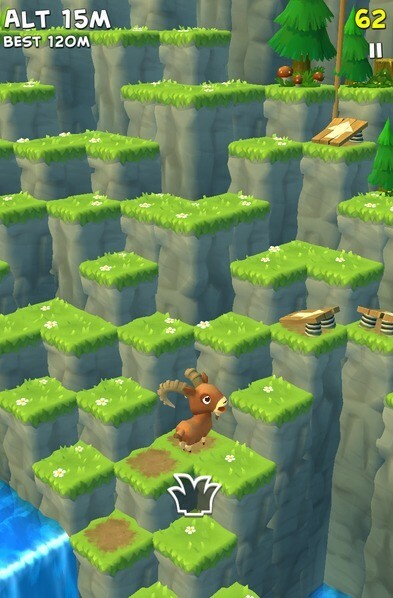 The poor little goat needs food, so be quick when you explore the mountain for grass. Start looking for food soon after the grass meter appears on the screen. Don’t worry if the meter goes down. You will still have a few seconds left to hop around in search for grass. Just don’t panic and choose regular slopes as grass grows on them. You may also choose to hop on springboards (if you spot any) to reach a new area in case you can’t find food around you. Always try to be on regular slopes as grass grows on them. Remember: Coins appear more on crumbling ledges and grass on regular ledges. Sometimes, jumping on a springboard may prove disastrous because you never know where your goat will land. On several occasions, I got boulder dashed or got crushed under a log after a springboard teleported me higher up the mountain. Don’t just blindly jump on any springboard. If you see a series of safe-to-climb ledges, choose them over a springboard. You can choose to hop up on a springboard (in case you spot one nearby) only when you feel the ledges aren’t safe to tread or you are surrounded by collapsing slopes. But look out for dark clouds hovering over them. A lightning strike will instantly kill your goat. But again taking such risks can reward you plenty of coins. The goat collects the treasure chest once he reaches that ledge. The treasure chest or a big coin will be yours even if he gets struck by lightning. Death is inevitable in Mountain Goat Mountain, so why don’t you choose the hardest route before falling under a boulder or getting smashed by a log? If you are not concerned about beating your previous altitude score, and are only looking to unlock different goats then I would suggest jumping on dangerous slopes to earn coins. Don’t worry. The coin count won’t reset to zero if your goat dies. You will find more coins on crumbling slope. They are hidden inside grass, but appear more frequently on loose ground. You will need to be dirt quick when you hop up on collapsing platforms. One millisecond delay and the ledge will fall to pieces. I just swipe up rapidly when I see a series of crumbling slopes. This has also helped me reach new altitudes and play with confidence when using new goats. You may ignore crumbling ledges and choose safer ground or a springboard, but trust me – the more you practice jumping on collapsing slope, the better you will be at this game (and the more coins you will earn). Use the regular Mountain Goat to practice climbing on challenging slopes, collect more coins and then play with unlocked goats. Many times, a video icon may appear soon after the game ends. Tap on it to watch a 30-second video to get coins for free. More free videos appear in the morning and at night, so look for them during these times of the day.